Initially, we set out to find an officiant who would respect our wishes; we both come from different backgrounds, and wanted a ceremony that was not religious, yet spiritual. When I spoke with Wendy for the first time, I knew she understood what we were looking for and she offered many suggestions for the ceremony. She was open to ideas, and even performed a “wine ceremony” which not many people had heard of, but it turned out to be really great! Before the wedding, I was nervous that the ceremony would be too long or too short. Wendy assured us that everything would run smoothly, and I received countless compliments on her and the ceremony itself. We would like to Thank Wendy for her professionalism, enthusiasm and superb services. We would hire her again in a heartbeat! Thanks Wendy!! Wendy, Our wedding day was everything we could have ever hoped for and more! You were an integral in making the day go exactly the way we wanted it, and you did! You helped our families and our friends celebrate our relationship in a beautiful ceremony, tailored just for us! It was unique, beautiful and personal!! You helped us begin the wedding ceremony and our lives together as husband and wife. Thank you SO much!!! Our ceremony could not have been more perfect!!. Wendy put together the most sincere and original words to make our day even more special!! By the end of the weekend, it was like her, and her husband, Hutch, were part of our family. 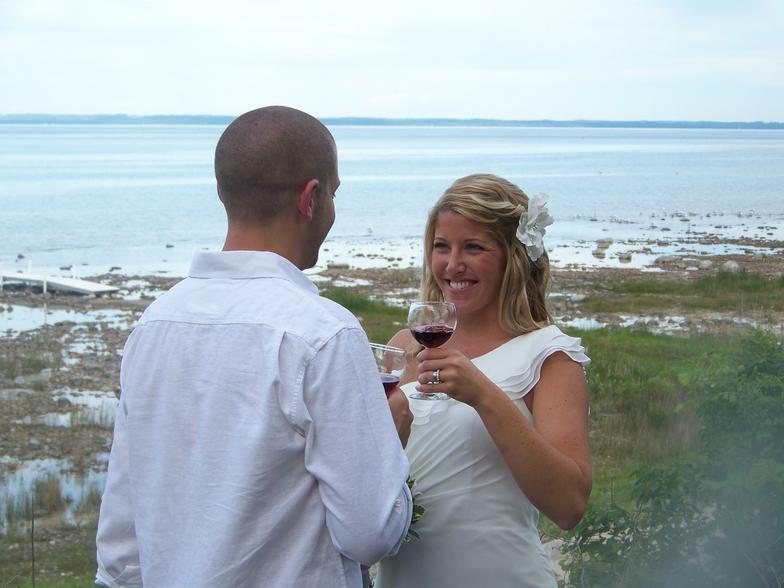 If you are getting married anywhere near Traverse City, we highly recommend you contact her company! 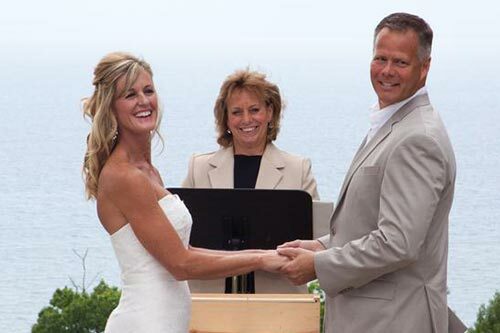 The very first time I spoke on the phone with Wendy , she was very interested in the type of relationship Scott and I had, and was eager to create a ceremony that was specifically tailored to us. After our first meeting with her, not only did we hire her as our officiant, she became our friend. Her passion for love and commitment came out in everything we talked about. We had a very honest conversations and very heartfelt laughs. It was like she was a part of our family. The ceremony she performed for us was just the same; very honest and full of heartfelt laughs ( that’s the type of people Scott and I are — laughy)! Thank you , Wendy, everything was perfect. It wouldn’t have been the same with anyone else!!! We love you and can’t wait to see you the next time we are in Traverse City. Being skiers and snowboarders , we found the perfect venue… We had our ceremony at the top of a mountain. Wendy was simply amazing! She washed all the stress away.. Knowing our appreciation of fine wines, Wendy, really captured our hearts,when she suggested a wine bottle wedding capsule to use during our vows… What a nice touch to our already beautiful day! 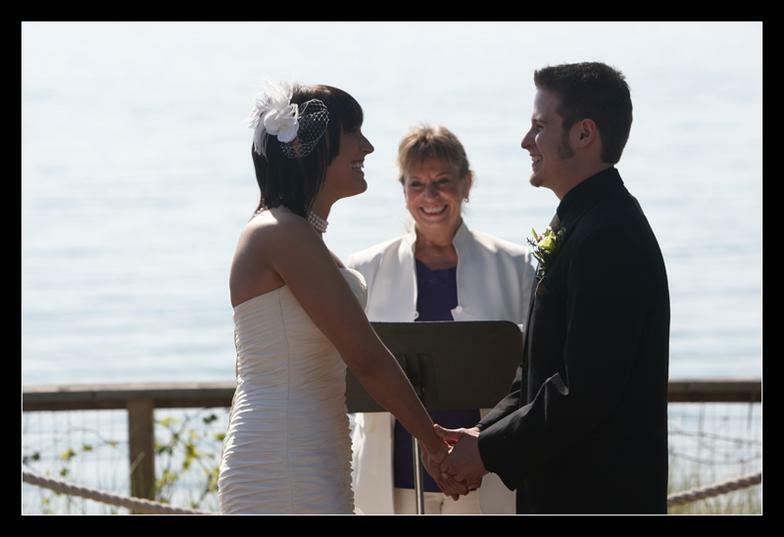 Wendy captured our desires wonderfully brought all of us to tears during the ceremony! Wendy went above and beyond to make our special wedding day , “perfect!” We would have no other person in this world marry us!! She brought being “personal” and “professional to the next level. 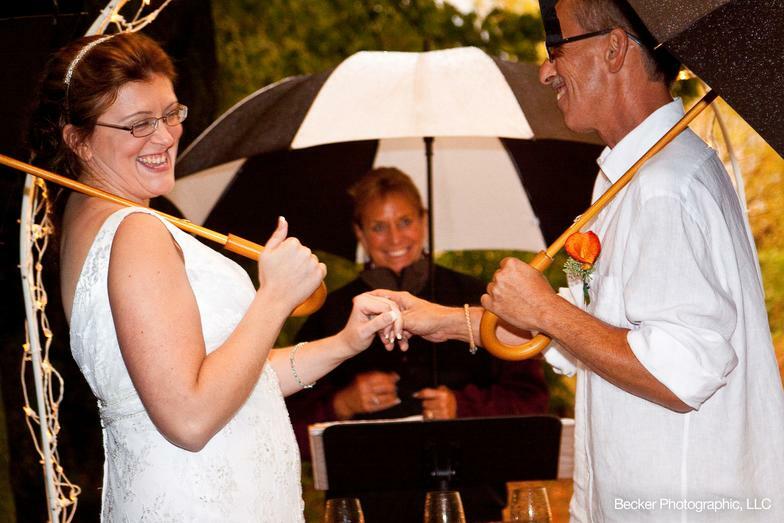 If you do not have a close connection to a church and are doing an outdoor ceremony, like ourselves– I would call Wendy at Weddings Your Way, ASAP!! Rick and Nichole met at a bike race and just knew that it was meant to be… they each owned dogs that looked exactly alike, and found many other common interests! The day of their wedding, they rode in a bike race in Traverse City, called the Mud, Sweat and Beers race… They dressed as a bride and groom in bike attire. Later, that day , they were married at Frog Pond Village and celebrated their new life together with many friends and relatives. Congratulations and best wishes to this truly amazing couple! Barry and Wendee were married in the rain!! However, that didn’t stop them from feeling the love and warmth of their wedding day! After the ceremony was over, they were blessed with the sight of a beautiful rainbow over West Bay on a beach outside of Traverse City. 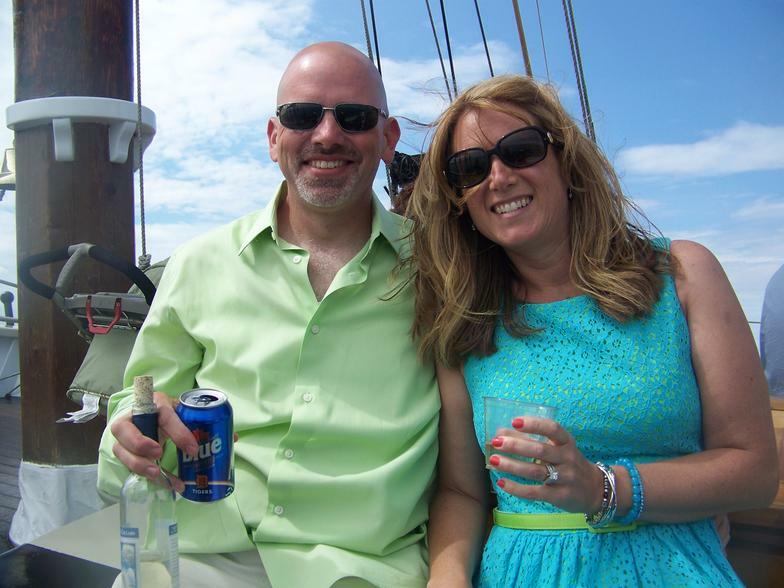 Mike and Cambra had a wonderful wedding sail aboard the “Tall Ship Manitou! !” It was a perfect afternoon with delicious appetizers and cocktails that followed the ceremony. The ceremony was performed by Wendy and Captain Brendan… Couldn’t have gone smoother!! Perfect! 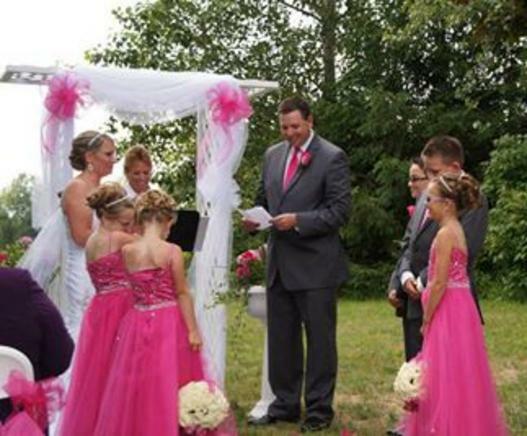 Shelly and Tim’s ceremony was filled with emotion as they read their vows to each other and then to the children. 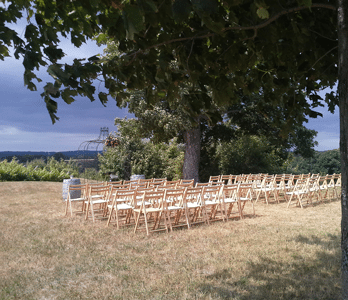 It was a beautiful backyard ceremony in Leelanau County!!! Shelly commented that Wendy was extremely helpful in putting the ceremony together!!! Perfect Ceremony! !